After a week the bed bugs came back. They were a surprise left-over from the previous occupants of the house. The mysterious rash that could have been a bite, the inky spots on the wall in the spare bedroom, the bug we saw scuttling over a pillow on the sofa. None of these things seemed like a problem until a late night Google binge told us they were unmistakeable signs of a bed bug infestation. It was becoming difficult to sleep. So we decided to rent a steamer and buy bug killing products off Amazon. Gerry tackled the industrial steamer, a blue robot from a seventies science fiction movie. I wore a mask and big gloves and followed him with the bug spray. Then we set off some smoke bombs. A couple of nights passed. No more bites. We thought might have won. Then they came back and it was time to phone a man with access to more potent poisons and pesticides. The man recommended stripping back the carpets as it was something we’d intended to do anyway. That was last Saturday. A brief conversation over a cup of coffee. “We’ll just take this carpet up”. The green, sticky mess crumpled in our hands, the rubber fell off the bottom and left mounds of fine sand-coloured dust on the floorboards. We tore up more carpet. More rubber sand. The floor boards were a pale grey underneath. There were gaps and holes, patches and some blackened bits. A mysterious dark shape revealed where a piece of furniture had once stood. The floorboards clashed horribly with the salmon pink wallpaper. We peeled off a small corner. A big sheet came loose, like a sail catching wind. It felt good. I could almost sense the house shaking off the weight of the years. Another corner, another sheet of wallpaper and then small finicky bits that didn’t seem to want to come off at all. Gerry used a screwdriver to pry loose one of the polystyrene ceiling tiles. It came off in one go. The next one was a bit more difficult, but he hacked away at it. I kept peeling wallpaper. After a couple of hours the first layer, the one they must have added in the sixties and seventies, was gone. We found the local dump and drove past HMP Belmarsh, where the UK detained people without charge or trial after 9/11. The road that runs past it is wide and fast. It’s difficult to get a glimpse of the prison. Then there is scrubby industrial wasteland, low warehouses, a large garage full of wrecked cars. This London is a different London. Back in the house we keep peeling away the layers. We’re now down to the plaster, once painted a dark forest green. The last layer of wallpaper, a yellow geometric pattern with ghostly imprints of large white flowers, is the most difficult to remove. We sponge it down with a mixture of hot water and fabric softener and scrape away at the stubborn bits. 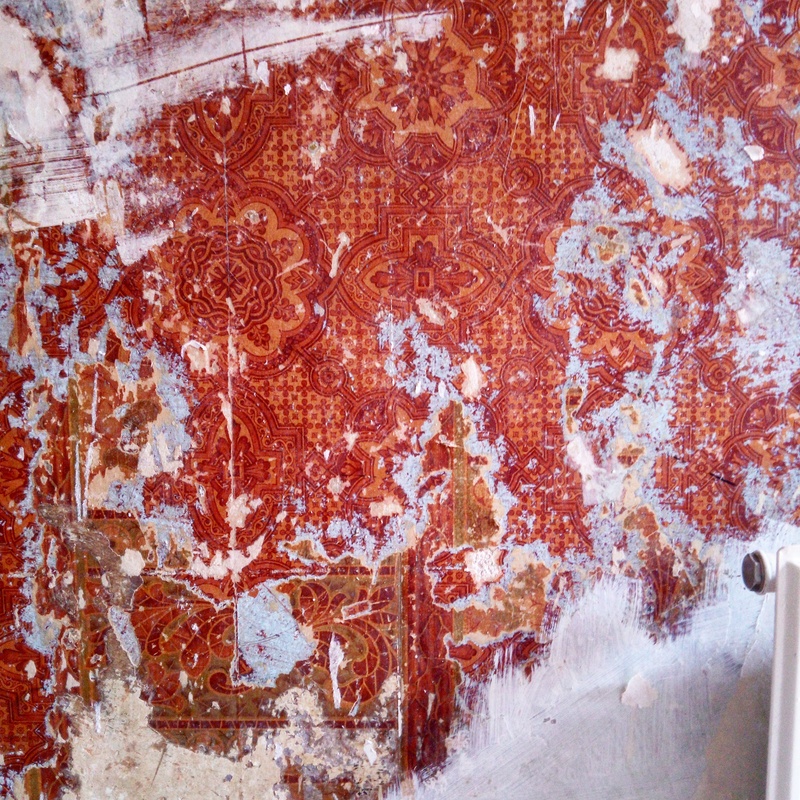 It takes time, the peeling and scraping, but in those moments there is nothing else than the wallpaper. Thoughts of work and worries and the political situation slip away. I can feel the room sighing with relief, the walls can breathe again. The bugs have stayed away for a week. We will keep peeling.